Scientific and publicistic magazine “Water sector in Kazakhstan” is issued by the Committee for Water Resources of the Kazakh Ministry of Agriculture. 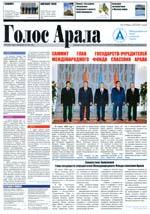 The magazine aims to popularize scientific achievements in water sector development, disseminate and apply advanced experience, familiarize a wide range of specialists and the community with the main results of scientific-practical conferences, symposia, exhibitions and workshops held, recent changes in legislation on water resources protection and use in the republic. We invite you - water specialists, scientists working in this direction, and a wide range of magazine readers – to take an active part in forming a magazine, feel free to send your research works, advanced practical experience, opinions on improving work status in this field to the editorial board. We thank you in advance for collaboration. We hope to receive comments in regard to effectiveness of our magazine “Water sector in Kazakhstan” from all the parties concerned as soon as possible. economy and development and so on. 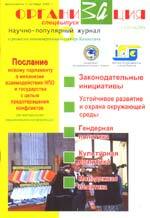 A popular scientific magazine on development of noncommercial sector in Kazakhstan published by the Institute of Development for Cooperation. 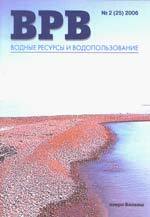 A monthly scientific and technical magazine issued by the Association of Water Supply and Sewerage Utilities of Kazakhstan. 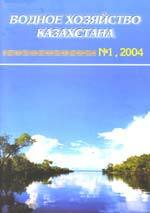 The publication is focused on the issues related to operation and construction of water supply and sewerage schemes, water resources management, environmental protection, dissemination of experience in introduction of advanced technologies, equipment and materials into water supply and sewerage sector. Newspaper published by Executive Committee of International Fund for Aral Saving. 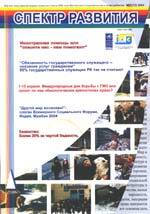 Publication is focused on treatment of question related to the ecological crisis in the Aral sea basin, IFAS activity, projects and programms implemented in the region.